The good news: Millions of American are talking on free cell phones right now. The bad news: You’re paying for it. A couple years ago, Michelle Obama was seen serving risotto at a soup kitchen down the street from the White House. She was surrounded by poor people frantically snapping photos of her with their cell phones. One couldn’t help but wonder how people whose financial situations are so precarious that they eat at a soup kitchen, yet can afford cell phones. Do a little Googling and you’ll quickly discover that there’s the equivalent of a government soup kitchen for cell phones. Sign up and the government will give you a free cell phone and 250 free minutes each and every month. Well, maybe not. You’re probably not eligible. If you’re not outraged by this program yet, hold on. Because you will be. It turns out that you only qualify if you’re already getting other assistance from the government. • You already participate in other State or Federal assistance program such as Federal Public Housing Assistance, Food Stamps and Medicaid. • Your total household income is at or below 135% of the poverty guidelines set by your State and/or the Federal Government. • No one in your household currently receives Lifeline Service through another phone carrier. • You have a valid United States Postal Address. 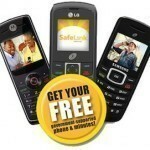 In order for us to ship you your free phone you must live at a residence that can receive mail from the US Post Office. Sorry, but P.O. Boxes cannot be accepted. Here’s where they really get tough. In addition to meeting those guidelines, you will be required to provide proof of your participation in an assistance program, or proof of your income level. Welcome to the United States 2011. The more freebies you get, the more freebies you qualify for. Did you see anything on the list of qualifications that says you have to be a citizen or even a legal resident of the United States to qualify? It seems to be a glaring omission, doesn’t it? Two of the three biggest companies involved in this scam have Spanish language websites, leading to the not-too-unreasonable conclusion that a significant percentage of the free cell phones applicants conceivably could be, may be, might be undocumented aliens. You know, people who live in the United States, but don’t speak English. At least three large companies are involved in the free government cell phone scam. We were angered when we read their websites. And you probably will be, too. Because it turns out that if you’re an average, hardworking American citizen who pays for your own cell phone or land line telephone, you’re also paying for these deadbeats’ free cell phones and free minutes. Want proof? Check out your own phone bill. You’ll see that a little extra charge called the “Universal Service Fund” is added to your bill every month. For example, in our latest phone bill. The charge for the Universal Service Fund is 75 cents. Now 75 cents might not sound like much, but Wikipedia says there are nearly 300 million cell phones in the United States and another 300 million land lines. Do the math. At 75 cents each, that adds up to a lot of money. Turns out this isn’t a new program, just a new twist on an old program. The Universal Service Fund was created many years ago to bring telephone service to the rural parts of the country that were under-served by private phone companies. But when Bill Clinton signed the Telecommunications Act of 1996, the Universal Service Fund was expanded to include, you guessed it, free cell phones for the poor. No matter where they live. Is This Really a Government Program? It’s paid for by a federal government-mandated fee that’s automatically added to your phone bill every month. It’s administered by the Universal Service Administration Company, an organization set up by the Federal Communications Commission, which parcels the money out to private phone companies set up just to give away these free government cell phones. In other words, it’s no different than a sales tax collected by a merchant and sent to the government, which spends it as they see fit. In this case, the merchant just happens to be your phone company. As if it’s not bad enough that you’re paying for free cell phone service for other people when it’s tough enough to pay for your own, it gets even worse. There are three primary companies providing the LifeLine service – SafeLink Wireless, Assurance Wireless and ReachOut Wireless. Safelink, the largest player in the business, is owned by the world’s richest man, Mexican multi-billionaire Carlos Slim. The free government cell phone scam is very profitable for the companies involved. Obviously. A billionaire like Carlos Slim wouldn’t be involved otherwise. Each customer costs the cell phone company about $3 per month for phone and minutes. But the Universal Service Fund pays the cell phone companies $10 per month for each customer. It’s a brilliant scam. The government skims a few cents off the top of every phone bill, launders it through the free cell phone scam, and into the already stuffed pockets of a foreign billionaire. The rich get richer. The poor get something for nothing. And you get screwed. Free phone was started under Reagan, and they aren't totally free... Who wrote this nonsense. I don't receive a free phone, I am not disable or elderly ,or poor... Just informed . That idea dates back to 1934, under the Communications Act, but Reagan was the first to actually implement the legislation. The program grew under President Clinton, who recognized the advent of the newfangled new technology of cordless phones and expanded it to include cell phones. To qualify for the program you must live in a household with an income near the poverty line or be already qualified for other assistance programs like public housing or food stamps. Sounds like a very rational program. But in the lead up to the 2012 presidential election it has suddenly become the embodiment of the disgraceful government dependence of the poor--and in particular, minorities. The video reeks of welfare queen stereotypes, down to the “angry black woman.” In another example of Limbaugh’s ignorance, he first assumed that the women was actually a man--highlighting her supposed lack of femininity--and was then corrected. White supremacists responded to the video on the site Stormfront by writing, “racial inferiority on display” and calling the woman a “talking baboon.” The slew of racist responses to the video prompted the Atlanticto write a story teasing out “just how racist” the video is. Meanwhile, the program costs about $2.4 billion, which is approximately 2.3% of the amount the federal government spends annually on homeowner mortgage subsidies and a measly 0.38% of the amount the federal government will spend over the next five years oncorporate tax breaks. Who’s part of the 47. Oh, yes, the poor just LOVE being poor. It's so fun, you should try it. At the age of 53, I have been working and paying taxes and Social Security since the age of 10 -- that's right, I have in 43 years, 35 of which have been full time, often with a second job necessitated to make ends meet -- after which most people would be retired.. All this despite major health problems in my early 20's, followed by decades of being uninsured due to a pre-existing condition. Try paying for all your medical care and prescriptions on top of rent, utilities, groceries, student loans and all other life expenses from a wage that is limited by working in a female-dominated profession -- and you can't continue your education due to your outstanding student loans. I stopped working less than a year ago after decades of pain due to a degenerative spine and a hip that needs to be replaced. The teaser of 500 minutes for three months reduces after three months. It is not enough to cover my medical calls. I can't imagine how people swing job-hunting on this. In typical fashion, someone finds a reason to complain about helping anyone in dire straits. Much better to keep people unemployed (ever try applying for a job without a phone?) with a resulting increase in benefits needed due to unemployment. Let's please stay uninformed about corporate welfare, which far exceeds the cost of social programs. Is there fraud with the phone program? Undoubtedly -- but it costs us nowhere near the fraud and criminality of that of corporations and financial institutions. SO easy to judge from the stance of ignorance. Why is America so divided? Because we're bad neighbors to our fellow man. If you don't like programs like this, then stop using public schools, walking on public sidewalks, driving on public roads, calling the fire department or police -- these are no less social programs than the ones complained about by those who think they stand solely on their own without any aid from the government. And if you're concerned about where your money is going, perhaps you should be getting involved in politics and try to influence the fact that 59% of your taxes is spent for our military to terrorize other countries and make our country less safe with our ongoing wars and terrorism of other countries. Try facts, not emotion, and here's a fun fact: A study proved that those who watch only mainstream media are actually less informed than those who watch no news at all. How dare your u call people deadbeats. Yes maybe some people may take advantage of getting free cell phones but there are people like me who are on disability and can't work and don't have enough money to pay for phones. I'm 27 years old and trust me there's nothing better that I would like to do but work but because of my lupus and rheumatoid arthritis I can't. Sometimes I can hardly drive or get it out of bed and I'm so young so if that make me a deadbeat then so be it. Maybe you should take the time to understand certain peoples circumstances instead of labeling them deadbeats because some people can't control what happens to them. I know some people take advantage of the system but don't label everyone. @Shauny27 Its true, life is made up of a lot of luck /breaks and being in the right place at the right time. Being in good health and the right marriage. If you have all this you are the rich lucky ones. If you are from a poor family, its very hard. Well you could get married to a rich other. Money does make it a lot easier, as the old saying goes, don't judge until you have walked in another persons shoes for a mile, then if you have something to say, you will be a mile from them and they will be in bare feet. If being poor and getting a free ride is SO GOOD, and really a better, easier way of life, they why aren't you doing it? Even the most nihilistic must acknowledge that: Every society will always have a segment of the population that either can't or won't contribute a net benefit to society. Simply ignoring them, doesn't make them go away, locking them up isn't free either, sending them away incites conflict, killing them incenses the moral foundation of civilized society and policies that try to force compliance with some ideal criteria of participation will always be impossible for some and refused by others. History has proven time and again that neglected these people will, acting out of self-interest, undermine our collective well-being through ever greater acts of deviance, unless we take action to appease the most basic needs of the idle. It comes at a cost, and to that end and to what extent maybe debatable, but it is the only lesser evil, that we have found that though far from perfect, somewhat works. @tonya tipton: "The government" is you (assuming you pay taxes), myself, and everyone else that does. I am a conservative and conservatism does not rule out good will and is not heartless as it is always portrayed. Rather, it means good will is not the role of the government, but of the individual. When the government does "good will" programs like this of which almighty government determines what is "good will" (albeit free phones, free abortions – and the government does fund abortions which I abhor, free cars, ... name your freebie), it is a form of taxation without representation... especially since many of these sub-bureaucracies that lead these efforts are not made up of elected officials who the voting citizens have any say over. Now I may agree that some poor person needs something and when I see a need, I usually do give if I am able. However, I give it out of my own pocket and by my own accord; I do not go and tell my neighbor he needs to do it as well like the government does. If you want poor people to have cell phones, you are the solution. Go to the store and buy it yourself... give it away. When you do it, it is giving and I applaud that, but when the government does it, it is stealing, and it is disgraceful. I was just fired after 32 years with a magazine distributor for refusing to distribute the safelink brochures. This crap is morally reprehensible. I'm about to lose it all based this entitlement crap. Is there a lawyer out there who can help me? I doubt it. I am so tired of people not working for what they get. I work for the school system in food service and it does not pay well. But I pay for my own cell phone as well as everything else. No wonder people don't get off the hand out service of welfare because this new government rewards them to stay on it. The hand outs just keep coming. We pay their rent, utilities, food. schools, and now cell phones. I am tired of paying my bills and everyone elses. If lazy people would get out and earn a honest living like good Americans everyone could provide for themselves and our economy would not be where it is today. So get off your hind and work lazy people. I cannot tell you how much I agree with you. These cell phones are used primarily for PERSONAL use. I'm tired of providing FREE for people who will not work. That is not government's job. Well I think that's wonderful that low income people get free cell phones from the government.